Affinity Creative Group was well represented at last night’s West Coast POP Show in San Francisco. An annual in-store marketing and display event, the show provides an opportunity for agencies and display companies to come together and share their most creative retail marketing work. Affinity Retail Division entered several unique displays showcasing our range of creative talent and production expertise, including Smoking Loon Canoe, Sutter Home Spring Window, Flowers “Give Her The Gift She Really Wants”, Bota Box Spring Adventure Backpack, Red Diamond “Day of the Red”, and the Ménage À Trois Ferris Wheel Display. In this highly competitive category of Floorstand Display/Non-Permanent (Wine, Beer & Spirits), the Ménage À TroisFerris Wheel was highly awarded with honors of Gold in Category, Best Structural Design, and, the most coveted award of the evening: Best of Show. 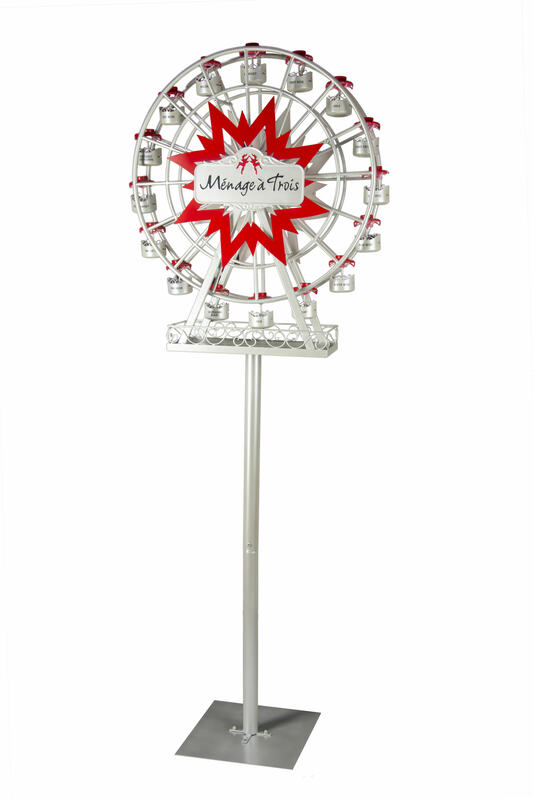 Trinchero Family Estates designer Jerry Braccia came to Affinity Creative Group for production expertise in bringing his ferris wheel design vision to life. From concept sketches and discussion, Affinity Creative Group collaborated with the client to create a spectacular and eye-catching display. Constructed out of wire/tubing and sheet metal, this large ferris wheel themed pole topper display was helpful in securing 40–50 case stackings of wine on the floor of major grocery retailers while capturing the essence of the brand—approachable, fun, and good for any occasion. Two-sided, this display could be used as an island or endcap display in any store and created an exciting and fun retail experience for the consumer.